At Bluecaps we have a herd of llamas and our two Studs are Juno and Drizzle. Drizzle tends to cover most of our females as they are descendants of Black Jack thus enabling Juno free to cover visiting females. 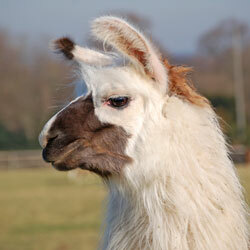 Drizzle came to us a few years ago and carries Ordell Llamas bloodlines. 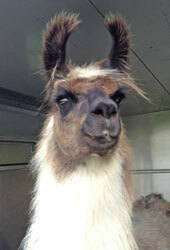 Both llamas are very woolly and have very kind and laid back temperaments. 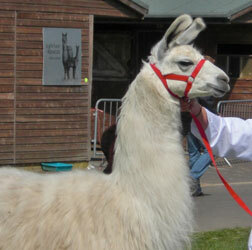 Llamas make fabulous pets as they are very gentle and inquisitive. You can take them for walks, although these are walks with a difference. 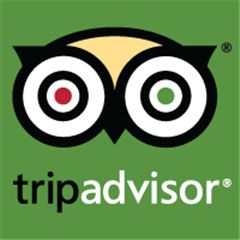 You have to try it to appreciate it! 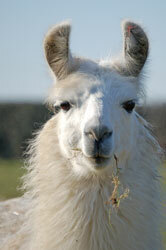 (See our llama trekking page!) 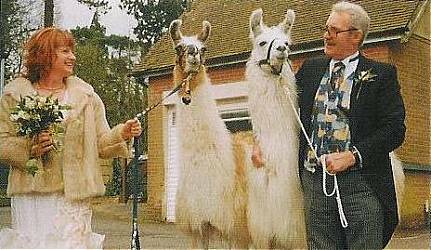 We used to take our llamas to shows where they were very proud to strut their stuff, and of course it was always nice to come home with a rosette or two. 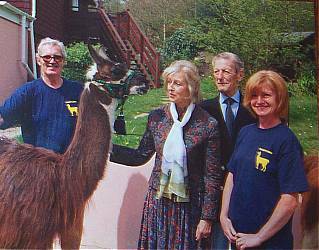 We were very proud that Bluecaps Cilla was Supreme Champion Llama at the South of England Spring Show in 2006. Dusty was also Supreme Champion in the same year at Kent, whilst Amelia won the same title at Edenbridge and Oxted in 2008. Our llamas are also available for photo shoots and recently they have obtained further employment – namely as attendants at weddings on which they were very keen and would like to do some more! 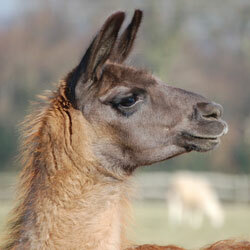 Llamas are also for sale (see our For Sale page) or we run an adoption scheme. 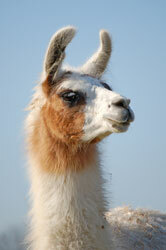 Llamas originate from South America where they are used mostly as pack animals. Llamas are used as ‘guard animals’ to protect sheep and indeed other animals from predators, which is particularly invaluable at lambing time. 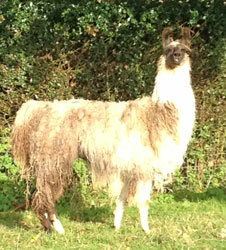 A dog or fox is a pretty sorry sight after a llama has reprimanded it! The average weight of an adult llama is 113 kg (250 lbs). The average height of an adult llama is 100-115cm (40-45"). "Do llamas spit?" is a commonly asked question, but it is rare for a well-handled llama to spit at humans, although they do sometimes spit at each other. Male llamas mate with the female in a lying down position and mating lasts for approximately 30 minutes. The lifespan of the average llama is 15-29 years.